8% of Ethiopian Airlines passengers were over 60. 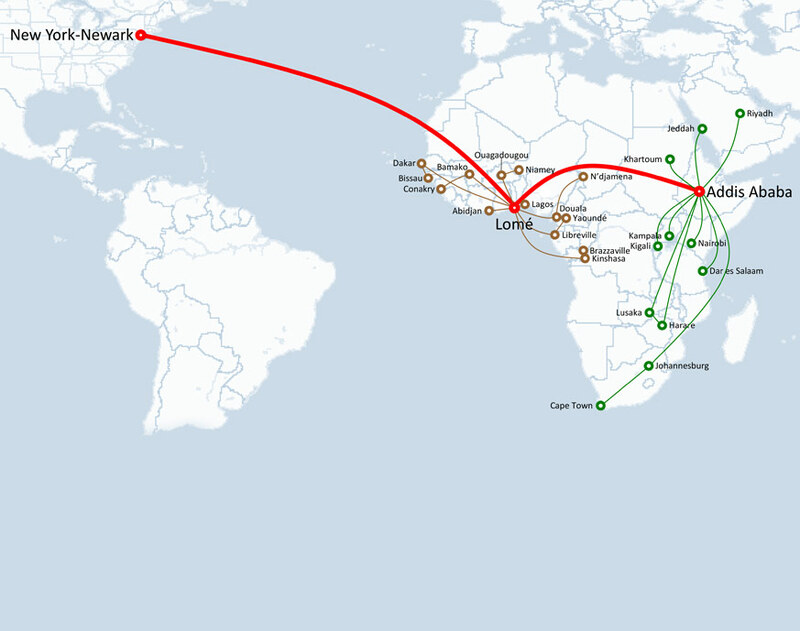 The top travel destinations for Ethiopian Airlines passengers were Addis Ababa, Newark, Lome. The most popular airport for Ethiopian Airlines was Addis Ababa Bole International Airport. Ethiopian Airlines is all set to start flights from Addis Ababa to New York and Houston commencing June 2019. Flights from Addis Ababa to New York will commence on 17 June 2019 and will take a halt in Abidjan. Moreover, flights from Addis Ababa to Houston will commence on 23 June 2019. Both flight routes will be operated on airline’s Boeing 787-8 Dreamliner fleet. With its hub at Bole International Airport, Ethiopian Airlines is fully owned by the country's government. Known as the flag carrier of Ethiopia, it was founded in 1945 and is headquartered at Bole International Airport, Addis Ababa, Ethiopia. It has an advanced fleet size of 60 aircrafts that serves around 80 passenger destinations and 17 cargo destinations. Ethiopian Airlines is known for its slogan 'The New Spirit of Africa'. It also comprises of airport lounges that include Cloud Nine Lounge and ShebaMiles Lounge. It flies to the prominent destinations such as Beijing, Abidjan, Paris, Delhi, Nairobi, Kuala Lumpur, Lagos, Seoul, Stockholm, New York, Johannesburg, Toronto, Shanghai, Cairo, Hong Kong, Milan, Kuwait City, Washington DC, Bamako, Musact, Port Sudan, Bangkok and others. Aircrafts in its fleet comprises of Airbus A350-900, Boeing 737–700, Boeing 737–800, Boeing 757–200, Boeing 767-300ER, Boeing 777-200LR, Boeing 777-300ER, Boeing 787–8 and Bombardier Dash 8 Q400. Also known for flying more destinations in Africa than any other carrier, this airline is also a member of the International Air Transport Association and it also a Star Alliance member since December 2011. Economy Class: comfortable seats, light snacks, hot dishes, demand audio and video. Cloud Nine: spacious seats with extra legroom, complimentary beverages and drinks, on demand audio and video service. •On-demand audio and video, with 80 channels and 8.9-inched screens. Online check-in: Online check-in: Online-check in helps passenger to confirm their travel on flight via internet and also it print the boarding passes. The online check-in facility for international flight is available from 36 hours to 2 hours before the departure of flight. For all the domestic flights this facility is available from 24 hours to 2 hours before the departure of domestic flight. To avail this facility all you need is internet connection and printer for printing the boarding pass. Mobile Check-in: Mobile check-in facility gives you the advantage of check-in from anywhere irrespective of your location. Phone with internet connection is the primary requirement to use the mobile check-in facility. Airport Kiosks: Numerous self service airport check-in kiosks are very helpful for the smooth check-in facility. Equipped with interactive touch screens this facility undoubtedly helps in the smooth check-in. ShebaMiles is the frequent flyer program of Ethiopian Airlines. Collect the reward points to avail the cash discounts, free tickets and much more. Membership of this frequent flyer program is open for all the individuals all over the world. The applications for the membership of the frequent flyer program is available in the paper form, it can be mailed to the address on the back of the form. Application for the frequent flyer program should be submitted only once and don't forget to write down the full details on the application. Write the full name as it is on your passport. Check out the three categories of the ShebaMiles frequent flyer program. ShebaMiles Blue Membership Card: This membership card can be easily obtained by earning the 3,000 status miles or by completing 2 flights after enrollment to ShebaMiles. With this you can earn as well as redeem miles on Ethiopian Airlines and of it service partners. Personalized card and advance boarding facility is provided to the members of ShebaMiles Blue Membership Card. ShebaMiles Silver Membership Card: By earning minimum of 25,000 status miles or by completing 20 flights in one calendar year, you will get the membership of the ShebaMiles Silver Membership Card. The main function of this membership card is that it earns and redeem miles on the service of Ethiopian and its service partners. Use the tier benefits on each Ethiopian Airline flight after the qualification. The benefits of ShebaMiles Silver Membership Card include personalized card, personalized luggage tag, excess baggage allowance of 15 kgs, access to ShebaMiles lounge, advance boarding and priority baggage handling. ShebaMiles Gold Membership Card: After earning 50,000 status miles or by completing 40 flights in one year, you can upgrade to ShebaMiles Gold Membership Card. The benefits of gold membership include free excess baggage allowance of 20 kgs along with advance boarding and priority baggage handling. For any modification in the travel itinerary like cancellation, no-show, date change or refund, there are fixed charges for it. For cancellation of flight you have to pay 300 USD, for no-show the fees is 300 USD, date change fee is around 300 USD and for refund the fees is around 300 USD. •Young children that are travelling without a parent or legal guardian are to be considered as an unaccompanied minor. •Airline is responsible for escorting the unaccompanied minor through immigrations and custom and help him/her to board the flight on time. •If you are planning to carry your pet, in this case you have to inform airline about it. If airline gives permission for it, then you can take the pet alongside with you.